What’s the one pet peeve that everyone has with blenders? Food gets stuck on the side of the pitcher, and never gets blended properly. Hamilton Beach’s Wave Action blender aims to solve this problem with its unique Wave Action system. Through its unique design, this blender pulls the food mixture to the blades, ensuring that your food is blended properly every time. We’re excited to put this blender to the test, and we’re happy to say that it didn’t disappoint. The Wave Action blender has a sleek, modern design with stainless steel accents and a glass jar. It will take up too much space on your counter either, and it’s compact enough for easy storage in your cabinets when it’s not in use. We use our blender every morning to make smoothies, so we prefer to leave it out on the countertop for easy access. It looks great in any modern kitchen, and you’ll still have plenty of counter space leftover. Incredibly versatile, this blender will quickly become a staple in your kitchen. One thing that we really have to point out is that the lid on this blender has a mess-free pouring spout, which makes it so easy to pour smoothies or soups without making a mess. The Wave Action blender also boasts 700W of peak power, which is more than enough to blend frozen foods and crush ice with ease. The 48 ounce glass jar is a generous size and so easy to clean. Plus, all food areas are BPA free. 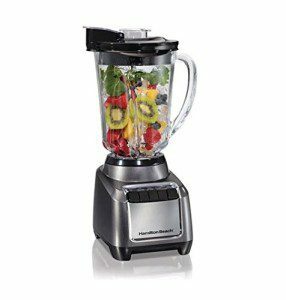 We used this blender to whip up smoothies with frozen fruits and vegetables, and enjoyed creamy, chunk-free results every time. We were surprised by how quickly and easily this blender crushed ice, and how it made quick work of frozen strawberries and bananas, which are notoriously difficult to blend. We used this blender to make cold soup and salsa, which was delightful. We did have an issue when making pesto, which other customers also had complaints about (more on that soon). The only issue we have with the Wave Action blender is that it requires 3 cups of liquid to blend properly. This means that if you’re making pesto or a similar sauce, you better be making a lot of it for the blender to work properly. When making our sauce, we found that the basil leaves didn’t even move. We weren’t the only ones to have this issue, but we’ll be the first to say that a food processor is truly the best option for pesto and similar sauces. Aside from this issue, the Wave Action blender is powerful, easy to clean, versatile and easy to use. If you’re looking an affordable blender that works just as well as a high-end model, Wave Action is the right choice for you.